The PrayerMate Christian prayer app for iPhone, iPad & iPod Touch has helped thousands of people be more faithful in prayer. I’ve been blown away by how many people have used it and got in touch to say how helpful they’ve found it – for something I wrote during an Easter holiday as a little side project, that ain’t bad! But there are still many many people out there who I’m sure would benefit from it, who are unable to use it because they’re Android users rather than Apple users. 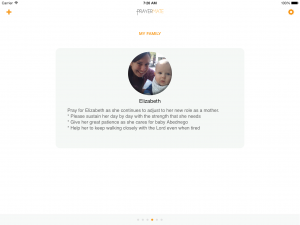 That’s why last night I launched a Kickstarter campaign to bring PrayerMate to Android. If you’ve not heard of Kickstarter before, it’s basically a way for creative projects like this to raise a specific finance goal directly from its supporters. You can pledge anything from £2 to £350, and if we don’t raise the full amount needed to complete the project, nobody has to pay a penny. Even the smallest donation would be appreciated, and would help show your support for the project, but if you pledge more then you can get access to some great rewards like an exclusive PrayerMate hoodie. Even if you’re not in a position to support the campaign financially, please spread the word far and wide – tell everybody you know: your postman, your cat, your Bible study group at church. We’ve got 29 days left to make this thing happen – support the campaign today! The address book “Quick import” now works properly, and quickly as well. I hadn’t realised quite how broken this was in the previous version, so apologies for that! Cards scheduled by day-of-the-month will display more than once – if you tried setting things up like this and found that they weren’t appearing, this should now be fixed. The first card now says “Coming Up” instead of “Today’s Prayers” to better reflect the fact that they’re not supposed to stay the same all day long. I know that a lot of people still want them to stay the same all day long – I have an idea for how to make this an option in the future, but for now it is what it is. I’ve implemented a workaround for a bug in iOS7 which means the keyboard was obscuring the last line of text as you were entering it. For those with a keen eye for detail, I’ve now made it so that all four PIN digit get filled in before the lock screen is dismissed. Each category page now has a “Change subject order” button. This allows you to manually change the order of subjects within a category, as well as automatically sorting the categories either alphabetically or in a random “shuffled” ordering. There is one final feature here: “auto-shuffle”. If you turn this on for a category, then PrayerMate will keep track of how many subjects in this category you have prayed through. Once you have prayed through every card in the category, it will then shuffle the order of all of the subjects in that category, until the next time you’ve prayed through them all. This is useful for those people who find that things get a bit stale when you always pray for people in the same order. When exporting to Dropbox, you now have the option to include photos. Naturally, when importing again you can then also choose to import those photos. It goes without saying that this could use up a lot of bandwidth, so you probably want to make sure you’re on Wi-Fi before using this feature. Now that the most serious bugs are addressed, I’m knuckling down to get syncing between devices working. I know that this is an important feature for a lot of users, so it is absolutely my highest priority now. I don’t plan on using iCloud for this, since using iCloud would prevent syncing with any future version of the app running on any non-Apple platforms. 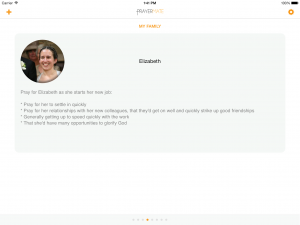 As an independent developer with a family and a full-time job (which is NOT to develop PrayerMate), it’s hard enough to find time to work on the iOS version of PrayerMate, let alone develop an entirely new version for other platforms such as Android. However, I recognise the vital importance of there being an Android version, and so I have plans under way to get another developer to build it on my behalf. Paying developers requires finance, however, so I’m planning on launching a crowd-funding campaign via Kickstarter to raise the funds needed (unless you fancy writing me a cheque for £2,000 to fund it yourself). If you would like to be kept up to date on progress in this area, please sign up for the PrayerMate newsletter. 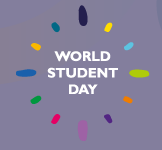 Tomorrow IFES has organised World Student Day – a day where they are encouraging people to commit to praying for students in one particular country. Their goal is to sign up 5,000 people to pray – whether you’re a student yourself or not. Being a student is such a crucial time in one’s life, where there’s real opportunity to grapple with the truths of the gospel. Christian Students have an unprecedented opportunity to share the gospel with those around them, such as they may never have again during their lifetime. Do think about whether you might sign up to pray for one particular country. IFES will then send you a handy fact sheet specific to that country to help you know how to pray. Handily, the fact sheet is in PDF format, which means that it’s perfect for slotting in to PrayerMate, to help you remember to pray tomorrow. You can download the PDF directly on your iPhone and choose “Open with PrayerMate”, or you can stick it in PrayerMate’s Dropbox folder and import it through the “Advanced Settings” menu (full instructions here). I suggest you create a separate “World Student Day” category on your phone with just the one item in it, and set that category to “Pinned” to guarantee that it’ll show up all day long. I’m chuffed to bits that PrayerMate has been shortlisted for the Christian New Media Awards 2013 under the “Christian Mobile or Tablet App of the Year” category. What an honour! Thank you SO much to any and all of you who helped make that happen by giving it your nomination. 2013 has been a big year for PrayerMate, that has seen lots of big new features. You can now subscribe to online prayer diaries from over twenty Christian organisations; it’s had a major redesign by the wonderful Dan Gould, including a super-snazzy new logo; you can now easily import lots of items through Dropbox, including PDF attachments; and PrayerMate also celebrated its 3,000th download since it launched back in May 2011. I still have plenty of ideas for new features in the pipeline, and in many ways it feels like I’m still only just getting started. My prayer is that it will continue prove to be a great tool to help people pray, and that it will do so more and more as it slowly grows and develops.